So, my daughter started high school today. Time is flying by way too fast!!! How did I cope? 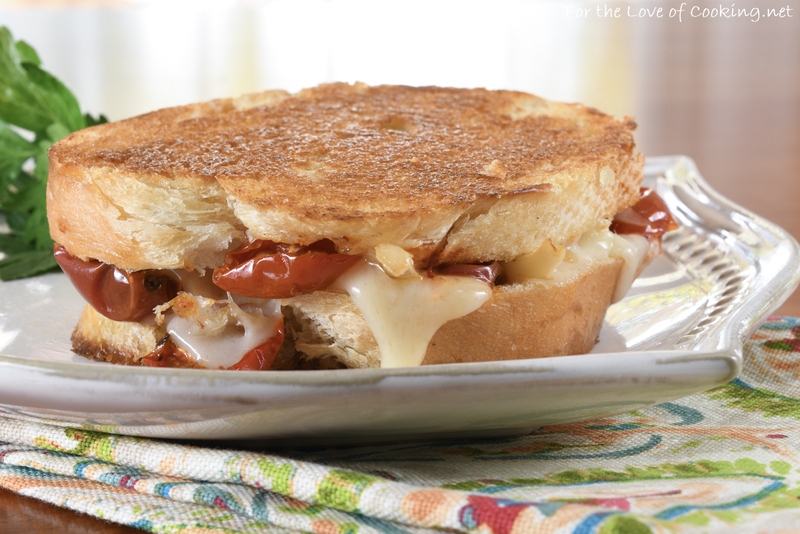 I made this decadent Gruyere, slow roasted cherry tomatoes, and caramelized onion grilled cheese for lunch. Totally unhealthy. Totally delicious. Totally worth it. I savored each and every bite and LOVED it. 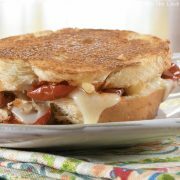 This sandwich has such a great combination of flavors & textures – it’s seriously the best grilled cheese I’ve ever had. I may just do it all over again tomorrow when my son starts 7th grade. Gulp. 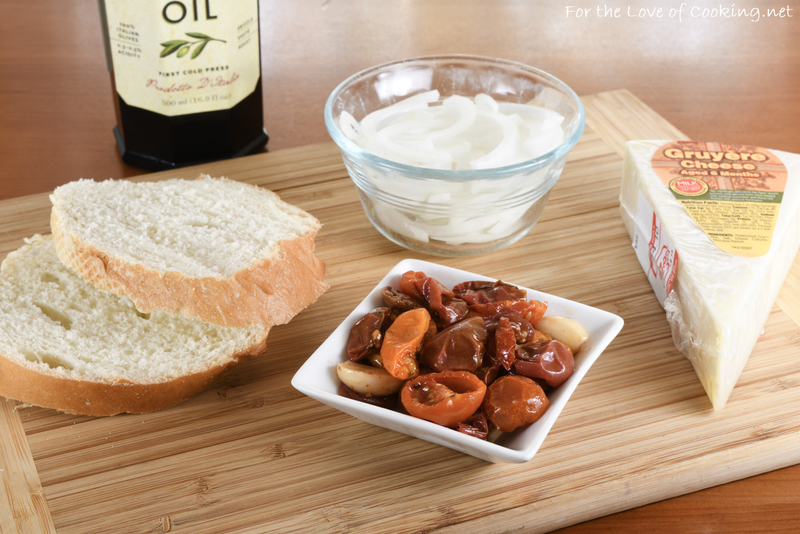 Make the slow roasted cherry tomatoes – click this link for the recipe. They take three hours to make but are SO worth it!! 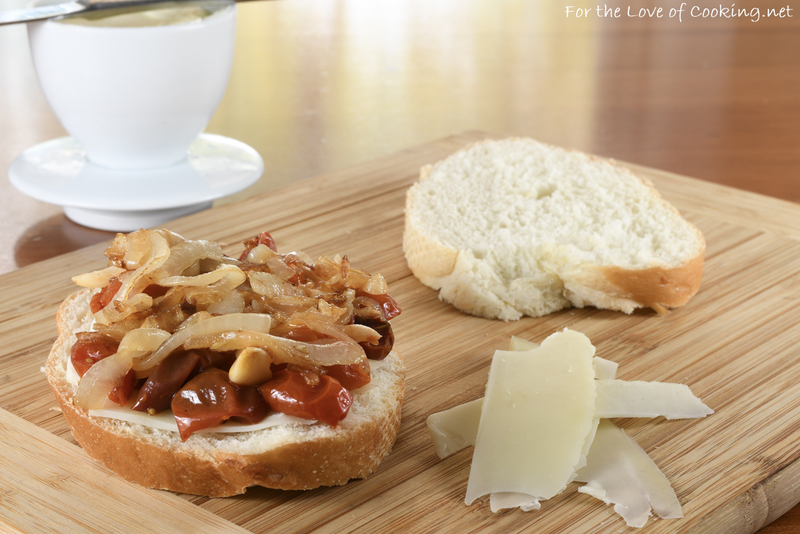 Make the caramelized onions by heating the olive oil in a small skillet over medium heat. Add the onion and cook, stirring often, for 10 minutes, or until golden brown. Season with a bit of sea salt, to taste. Spread butter over one side of a piece of the French bread and place into a skillet over medium heat. Add a thin layer of Gruyere cheese on the bread, then spoon some of the slow roasted cherry tomatoes and garlic on top, followed by a layer of the caramelized onions. Top with more Gruyere cheese slices followed by the remaining piece of French bread. Spread butter on the top of the bread and cook for 3-4 minutes, or until golden brown. Carefully flip over and cook for an additional 3 minutes, or until golden brown. Remove from the skillet and serve immediately. Enjoy! Make the slow roasted cherry tomatoes - click link up above for the recipe. Make the caramelized onions by heating the olive oil in a small skillet over medium heat. Add the onion and cook, stirring often, for 10 minutes, or until golden brown. Season with a bit of sea salt, to taste. Spread butter over one side of a piece of the French bread and place into a skillet over medium heat. Add a thin layer of Gruyere cheese on the bread, then spoon some of the slow roasted cherry tomatoes and garlic on top, followed by a layer of the caramelized onions. Top with more Gruyere cheese slices followed by the remaining piece of French bread. Spread butter on the top of the bread and cook for 3-4 minutes, or until golden brown. Carefully flip over and cook for an additional 3 minutes, or until golden brown. Remove from the skillet and serve immediately. Enjoy! 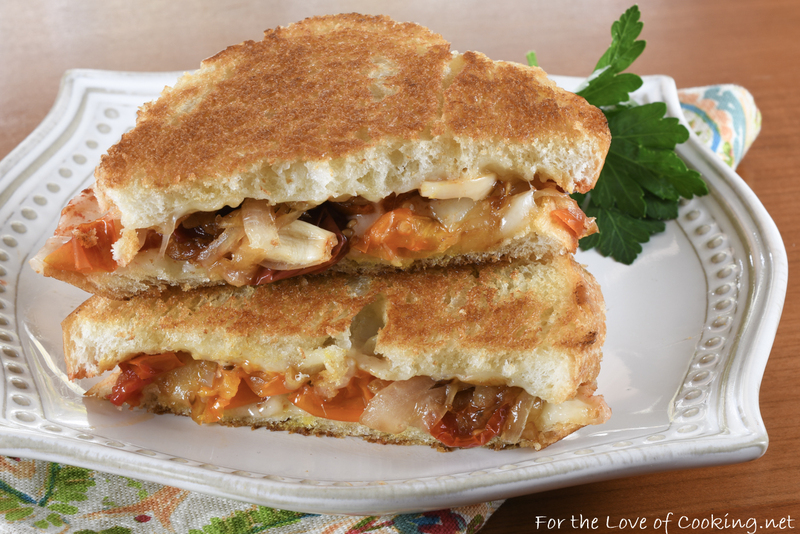 Gruyere grilled cheese is the BEST, but I can imagine it’s even more awesome with those tomatoes and caramelized onions… Yum!! What a great looking grilled cheese Pam – Our kids are experiencing the first child going away to college and I have to believe the moms are feeling it. What a delicious looking sandwich. Grilled cheese is my favorite. It is FOR SURE comfort food season, and to me that means making lots of grilled cheese! I love that you doctored it up with those candy tomatoes and caramelized onions. So good!